My husband loves onion rings. I should make these for him. 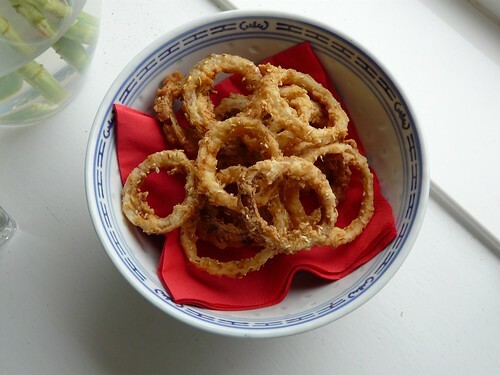 I love your tip for soaking the onion rings, although I love onions I don’t want to still taste them 3 hours after eating them. The addition of oatmeal is genius. I had a deep fryer when I lived with an ex-boyfriend. It was used the sum total of once during the three years we lived together. These look good and do-able. Have a wonderful getaway weekend! I know what you mean about being scared of all that hot fat. My problem is that I don’t know what to do with the oil once it’s cooled …. I love onions too much! Looking at those one got my mouth watering!Thanks for sharing..
Real potato chips made by mother – food of the gods! If you use a le creuset type casserole to deep fry it does contain the oil even when it bubbles up but don’t make the oil too deep. WANT! They look amazing. Love the little bits of oatmeal – that must have made for an exceptional crunch. I also have the fear of large quantities of hot oil. It’s a bit of a nightmare unless you have a deep fat fryer with a temperature gauge on it. When my boyfriend does chips I get so anxious I question whether it’s worth it! 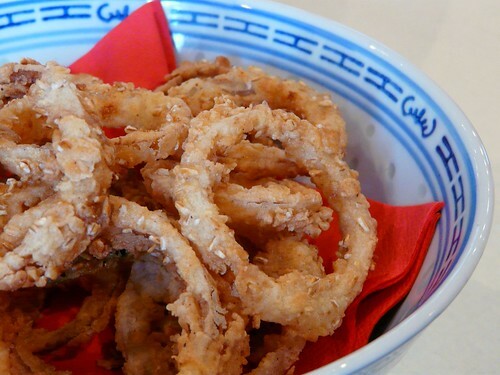 Anyway, fab onion rings. I do take the plunge every now and again so I will give them a go.